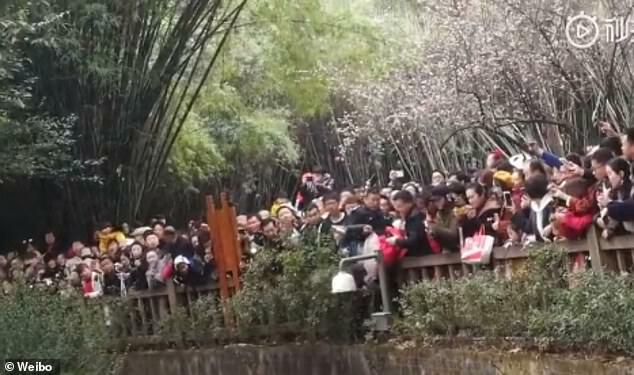 A little girl had been rescued after falling into a panda enclosure at a reserve in south-west China. 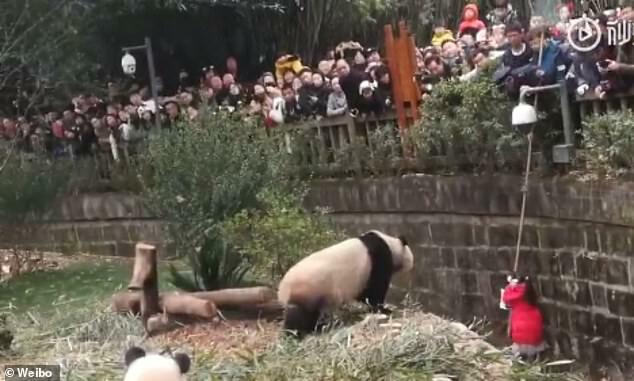 Dramatic footage on Saturday shows a security guard trying to reach the girl, dressed in red, with a pole before leaning through a gap to pull her up as three giant pandas approached her. 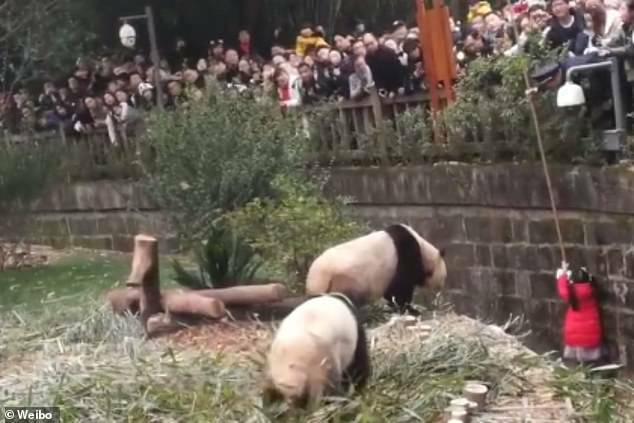 The unnamed girl, who appears to be aged around five, fell about two metres (6.5 feet) into a trench around the perimeter of the panda enclosure at the Chengdu Research Base of Giant Panda Breeding in Sichuan province, according to Chinese media. 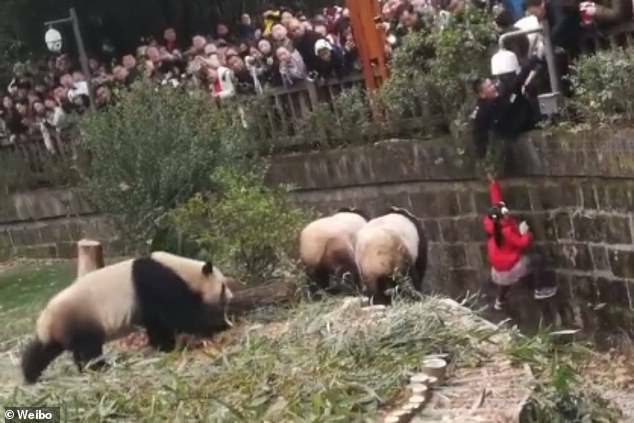 Luckily, the pandas appeared to be only curious and made no attempt to attack the child. As horrified visitors watched on, the security guard leaned through a gap in the fence to grab the girl’s hand and pulled her to safety, despite losing his cap in the process. The girl had been sitting on the fence, which was about a metre (3.3 feet) high, when she fell backwards into the enclosure, according to state broadcaster CCTV. The Chengdu Giant Panda Breeding Research Base, founded in 1987, aims to increase the population of giant pandas through research and conservation efforts and eventually release some of the animals back into the wild. The state-run centre has one of the largest collection of captive-bred pandas in the world. As of 2015, it has bred a total of 214 cubs, many of them sent to zoos around the world. The giant panda, considered a national treasure of China, was moved off the endangered species list in 2016 after years of intensive conservation efforts. The International Union for Conservation of Nature (IUCN) said in a report that the animal has been classified as ‘vulnerable’, reflecting its growing numbers in the wild in southern China. WHAT DO WE KNOW ABOUT GIANT PANDAS? There are an estimated 1,600 giant pandas living in the wild currently and 300 in zoos and breeding centres around the world. Experts are unclear what age giant pandas can reach in the wild, but the oldest panda reared in captivity so far is 38 years old. A wild panda’s diet is 99 per cent bamboo, with the remaining one per cent made up of small rodents. Giant Pandas need to consume around 20 to 40 pounds (10 to 20 kg) of bamboo each day to get the nutrients they need. Giant Pandas stand at around three to four feet tall when standing on all four legs. Cubs do not open their eyes until they are six to eight weeks of age and are not able to move independently until three months old. 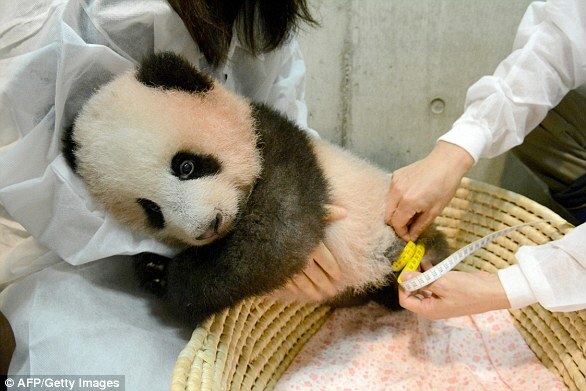 A newborn panda is about the size of a stick of butter, or about 1/900th the size of its mother.